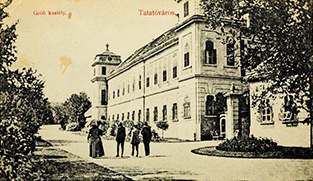 After the end of the Ottoman wars in 1727, Tata and its surroundings came into the Esterházy family’s possession. Tata was turned into the centre of the family’s estate and was refurbished and enlarged beautifully. The work was mostly done by German builders and the town became of the most beautiful baroque places in the county of Komárom. 50 to 60 German families populated Tata between 1733 and 1750. 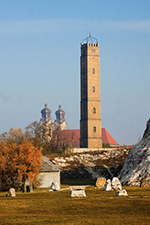 A part of the Catholic settlers moved to the outskirts of the village towards Kocs; this district was called “Neu-Stift”. The name remains until today in its “Hungarianised” version “Nájstik”. From 1736 to 1830, Nájstik had its own school with a German schoolmaster. Work on the castle on the shore of the Old Lake was started in the 1300s. This „pearl of Tata“ saw its heydays as a royal sanatorium during the reign of Sigismund of Luxemburg and Matthias Rex. Today, only its south wing remains. Records from the 13th century already mention mills in the area of Tata. On a map from the 1830s, 15 mills are listed. Six of them were fulling mills the others were gristmills. A hundred years later, only four of the mills were still operating. Due to the mining in Tatbánya and the exhaustion of karst water, the wells ran dry. 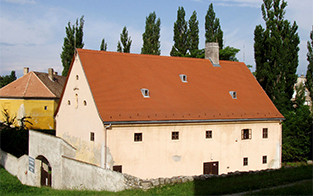 The museum for the Germans of Hungary in Tata was established in 1972 as a basic museum for the German minority in Hungary. It exhibits typical items from every region of Hungary in which Germans had settled. It is located in the baroque Nepomucenus-Mill which was designed by the famous architect Jakob Fellner and constructed in 1758. From afar, one can see the bare hill and the Cavalry (designed by Jakob Fellner) with its Golgota stuatues. The look-out was originally used for melting lead shots for shotguns. In the early 1760s, Prince Miklós Esterházy commissioned Jakob Fellner to demolish the castle and built a palace in its place. The late-baroque building on the shore of the Old Lake is known for its architecture, its rich interiors, the 18th-century park and its English garden. 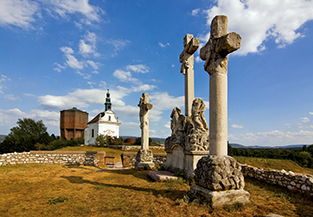 Legend has it that Franz, King of Hungary, and his wife Ludovika lived here during the retreat of Napoleon’s troops. The Old Lake of Tata is one of the oldest artificial lakes in Hungary. The lake and its surrounding marshlands were constructed as a protective barrier for the castle. When the marshlands were drained in the 18th century, today’s structure of the lakes emerged. The lake and its surroundings are a nature reserve today, but can be accessed for touristic and recreational purposes. In fall- and wintertime, thousands of wild gooses and other migratory birds populate the lake, which is unique for a urban lake in the whole of Europe. View of Tata on a 17th-century engraving. The dynamic group of statues of Golgota from 1770. LEFT: Tata’s 40 metre high look-out. RIGHT: The four lakes of Tata cover a surface of 201,5 ha and contain 4,37 m3 water. The late-baroque Esterházy palace on the shore of Tata’s Old Lake.